DAVAO CITY, Philippines (February 10, 2018) – Another 400 Overseas Filipino Workers ( OFW ) are coming home to their family in the Philippines February 11, from Kuwait. Earlier, the Department of Foreign Affairs (DFA) Usec. Sarah Lou Arriola said there will be 800 OFWs in Kuwait, most of them are domestic helpers scheduled to return to the Philippines this year. On February 12, Monday, there will be 150 OFWs and on February 13, Tuesday, 250 OFWs are expected to arrive in the country with our government assistance. Last night, when President Rodrigo Duterte met with the media, he instructed Labor Secretary Silvestre Bello III to make way for all OFWs in Kuwait to return to the Philippines. It is no longer a matter of money or no money, as long as he wants them to return home within 72 hours. 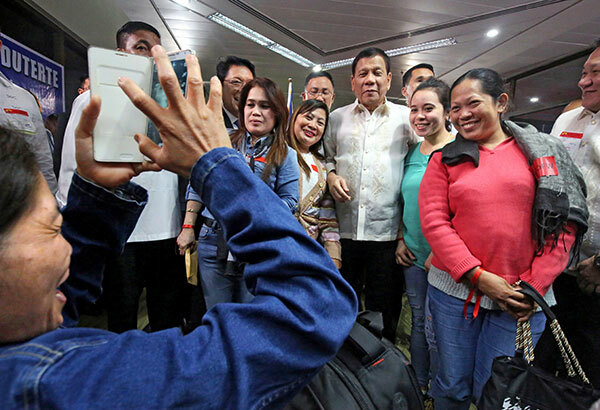 According to President Duterte, he will talk with Philippine Airlines and Cebu Pacific to be the transportation of OFWs who want to return to the Philippines. “So everyone who wants to come home, I said to Secretary Bello, those who want to be repatriated, with or without money, I will ask PAL and Cebu Pacific to provide the transportation. I want them out of the country those who want to go out in 72 hours,” said Pres. Duterte. Duterte added that the time of the Filipinos outside the country is important especially to those who experience or victims of abuse from their employers. “We will count our lives by the hours because apparently, every hour, there is a suffering and agony, brutality committed by Filipinos,” added the president. Last January 19, 2018, President Rodrigo Duterte declared the suspension of the processing of new overseas employment certificates for those who want to work in Kuwait. It is during the investigation of the death of seven OFWs there. Gallo Campollo Kisha Marie: Attention!!!OWWA!!Phi.embassy!!! Maghouse to house inspection po kayo,my mga DH na hndi pinapayagang umuwi ng mga amo kahit tpz na ang kontrata nla..humihingi cla ng tulong...!!!! Good job PRESIDENT DUTERTE; bring first all out ,who like to go out; with or without documents ; cos their employer will not give; i bet. after they out of Kuwait; pls fight for the right of payment their work , cos to make here in your country a new start; they need help and money. Lhenege Durante: Good job tatay Digong!! Sa panahon ngayon mas importanteng mabuhay sa sariling bansa kesa manilbihan sa bayan ng dayuhan na hindi mo cgurado ang iyong kinabukasan at kaligtasan. Ang mga kontra sa Duterte nation sila iyong member ng mga ugaling hayop at kampon ng Diablo aminan na tayo mahirap mawalan ng trabaho at magugutom ang pamilya pero sana intindihin din ninyo ang mga hinde sinuwerte sa among arabo di ba sana hanggat maaga mailigtas sila sa kamay ng mga amo nilang kampon ni satanas at sugo ng Diablo sa mga sinuwerte naman sa among arabo god bless. Sana matigil na ang pagpatay sa mga pilipinang kasambahay. Christopher Aguilar: Thank u so much mr.president sa tulong mo sa kababayan natin ofw..sana mabigyan din sila ng source of income and training for livelihood ,mga trainor galing sa private sector at govt side at lalo na maturuan sila ng financial literacy at spiritual seminat...mabuhay po kaya..we support u and u r the only of our country..we seabased and landbased ofw we support u always..kep n safe kasi maraming gustong pabagsakin ka at yong hindi gustong mgbago ang pinas puro lng critic at wala naman silang na -contribute sa bansa na makakabuti sa mamamayan at sa bayan..lahat sila mga liabilities at hindi asset ng bansang pilipinas..move on ,wag maging bitter nakakatanda at nakakapangit..